You tell me, “Everything was great! !” then proceed to leave me a measly 10% tip on the bill. Please, let me show my appreciation by helping you get down these stairs. . .the fast way. 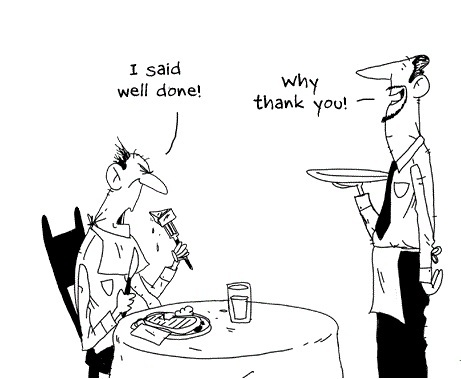 Dear verbal tipper, it’s great that you really loved everything about your meal, now get the hell outta here. Unfortunately, your “Everything was great! !” isn’t going to help me with my car payment. I have some verbal tips I’d like to share with you. bahahaha. i wish there was a way to like every single one of these. I worked food and bev in charleston and chicago and i swear to god you may be my long lost soul mate! (creepy??) love what your writing and i hope one person will read these and stop being such a douche when they go out! thank you for making my night a little better! Thanks a lot! Im glad you can identify with me. Many more to come because customers/”guests” cant stop being douches. Stay tuned! !